command kept hanging as well as any attempt to access the mounted NFS directory was not possible. It took me a short while to investigate and check the NetApp remote NFS storage filesystem and investigate the Virtual Machine that is running on top of OpenXen Hypervisor system. which seem to have a filters for MTU and are passing only packets with low MTU levels and using rsize / wzise custom mount NFS values in /etc/fstab could lead to this strange NFS hangs. Below is a list of Maximum Transmission Unit (MTU) for Media Transport excerpt taken from wikipedia as of time of writting this article. I've used tracepath command which is doing basicly the same as traceroute but could be run without root user and discovers hops (network routers) and shows MTU between path -> destionation. Optiomal pmtu for this connection is to be 1500 .traceroute in some cases might return hops with 'no reply' if there is a router UDP packet filtering implemented on it. The fix was as simple to lower MTU value for eth1 Ethernet interface to 1500 which is the value which most network routers are configured too. reassembly requires significant amount of CPU at both ends of the network connection. Packet fragmentation also exposes network traffic to greater unreliability, since a complete RPC request must be retransmitted if a UDP packet fragment is dropped for any reason. Any increase of RPC retransmissions, along with the possibility of increased timeouts, are the single worst impediment to performance for NFS over UDP. This and many more is very well explained in Optimizing NFS Performance page (which is a must reading) for any sys admin that plans to use NFS frequently. might be a good idea as this will increase the amount of packet size.and will raise network performance, however as always on distant networks with many router hops keeping MTU value as low as 1492 / 5000 is always a good idea. As I've started on job position – Linux Architect in last November 2018 in Itelligence AG as a contractor (External Service) – a great German company who hires the best IT specialists out there and offers a flexible time schedules for emploees doing various very cool IT advanced operations and Strategic advancement of SAP's Cloud used Technology and Services improvements for SAP SE – SAP S4HANA and HEC (HANA Enterprise Cloud) and been given for work hardware a shiny Lenovo Thinkpad 500 Laptop with Windows 10 OS (SAP pre-installed), I needed to make some SSH Tunnels to machines to (Hop Station / Jump hosts) for that purpose, after some experimenting with MobaXterm Free (Personal Edition 11.0) and the presumable limitations of tunnels of the free client as well as my laziness to add the multiple ssh tunnels to different ssh / rdp / vnc etc. servers, finally I decided to just copy all the tunnels from a colleague who runs Putty and again use the good old Putty – old school Winblows SSH Terminal Client but just for creating the SSH tunnels and for rest use MobaXterm, just like in old times while still employe in Hewlett Packard. For that reason to copy the Tunnels from my dear German Colleague Henry Beck (A good herated collegue who works in field of Storage dealing with NetApps / filer Clusters QNap etc.). file and accept the import. Note ! : It will not export your related (old system stored) SSH keys. 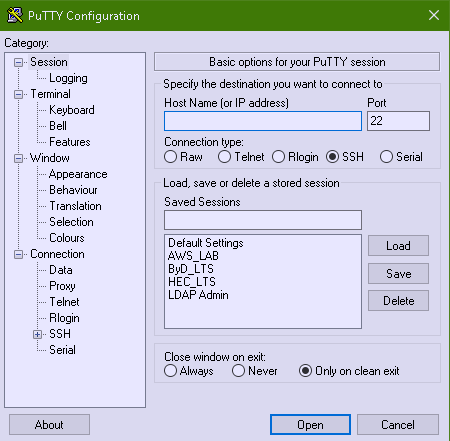 The result is in Putty you will have the Tunnel sessions loadable when you launch (Portable or installed) Putty version. you will see all the copied tunnels. 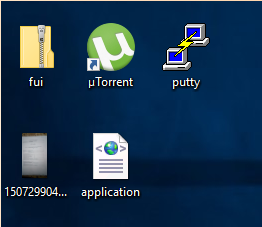 Recently I had to use PuTTY which I haven't used for years to open a number of SSH Pernanent Tunnels necessery for my daily work as a SAP Consultant. 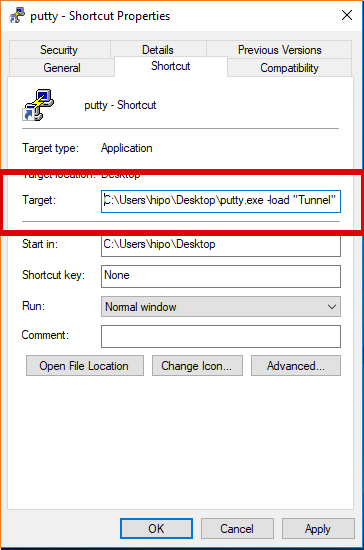 I've saved them under a certain new profile and saved the set SSH Tunnel configuration not in the default Session but in separate named one, therefore had to press Load button every time after clicking over my Putty shortcut icon. That was annoying and took few seconds out of my life every next morning for about a week, so finally I found osme time to google it and it seemed it is pretty easy to have any Putty sessoin loaded you like. 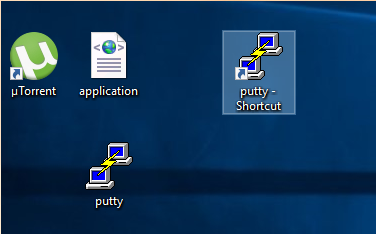 Click over Putty icon while holding CTRL + SHIFT (Control SHIFT keys simultaneously ) and move the mouse somewhere on the desktop to create the shortcut. "C:\Program Files\PuTTY\putty.exe" -load "your_saved_session" "username@your_server_address" -pw "your_password"
fill out "target" field of shortcut using above code (alter to your own properties). And Hooray !!! 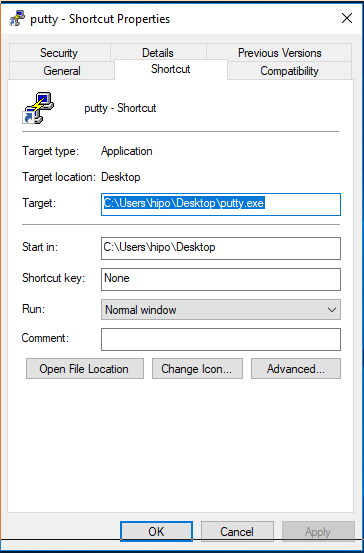 After that when you click on PuTTy shortcut it loads your session automatically using given username and password. If you want to run multiple virtual machines on GNU / Linux server or your Linux powered Desktop you have the possibility to use a couple of Virtual Machines just to name a few VirtualBox and VMWare are the option the native way to do it is using the Linux kernel via a loadable kernel module called KVM (Kernel-based Virtual Machine). Though Oracle's Virtualbox generally works and you could add new test beds virtual machines (install multiple Linux / *BSD OS) it is not fully Free Software and not even fully open source licensed, VMWare even though superior as a Virtualization product is proprietary and its application costs a lot of money which not each develpoper or small / mid-sized company could afford. Once the kvm.ko module is loaded your Linux kernel turns into a full-featured Virtual Machine Hypervisor. Starting with Linux kernel 2.6.X the KVM Hypervisor is available and easy to install virtually all modern Linux distributions Redhat / CentOS Debian / Ubuntu etc. support it and its up to running few commands to install and start using the Power of Kernel embedded Virtualization. KVM could be used to run in parallel multiple Operating Systems such as Windows / Linux / FreeBSD and others of BSDs family, each running under a separate virtual machine with its private dedicated (isolated), disc, graphic card, network card etc. To start up I assume you have already installed some kind of Linux distribution either locally or on a remote dedicated server. Once file is saved in vim editor restart the networking. To verify whether the bridge has been succesfully upped. 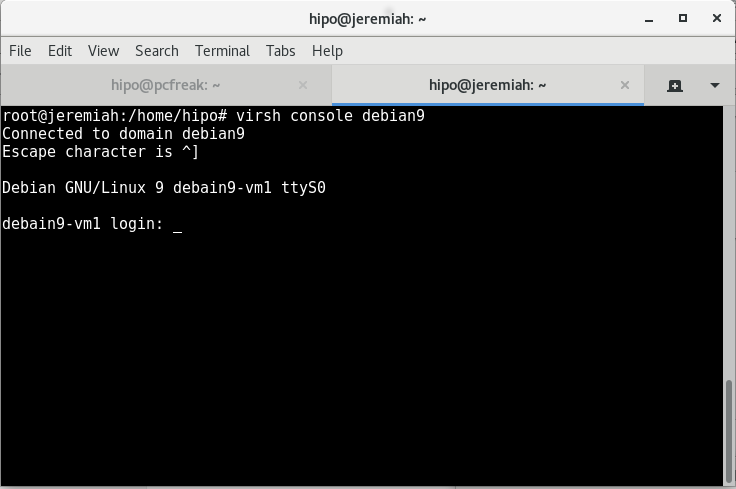 Below we'll create two images one for Fedora 28 and 1 for Debian 9 using the virt-builder (a tool to build virtual images quickly), the images that could be used are shown through below virt-builder –list command. Above two commands will download pre-packaged KVM isos and store them inside /var/lib/libvirt/images/ you see also the root (administrator) password for both ISOs printed out. 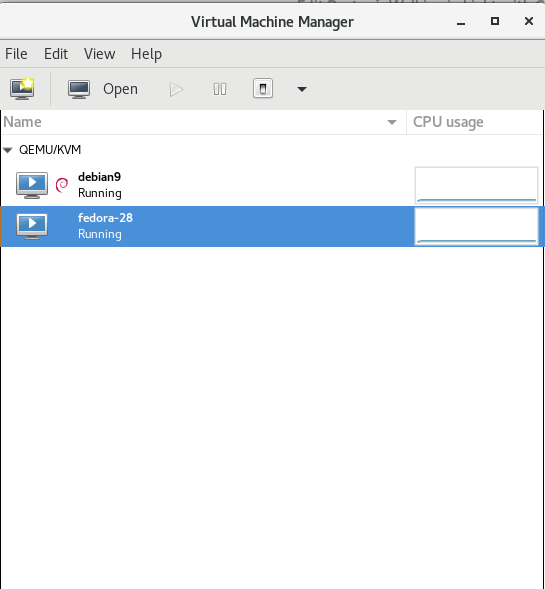 To access directly the new created VMs as we have specified the –vnc option it is possible to directly vnc to the new host with VNC client (in linux I use vncviewer), on Windows you can use something like TightVNC. 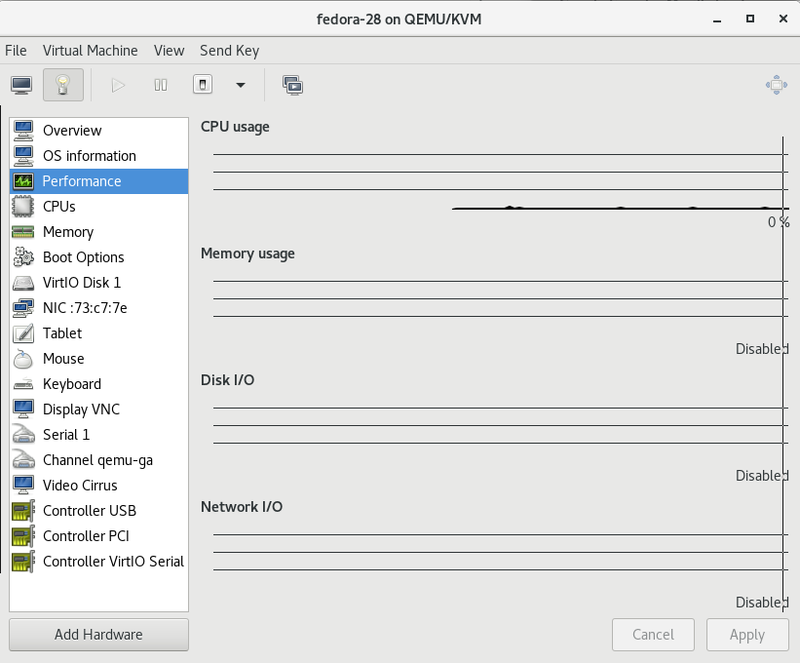 Those who would like to run inside KVM VM Linux could do it directly using installable ISO files and install the set of Linux with the required packages, just like installing a fresh new Linux on a bare-metal machine. To do so download your ISO image from the net (either from official distro website or a mirror website, in case if you need to spin an older version) and use virt-install to run the installer inside KVM. 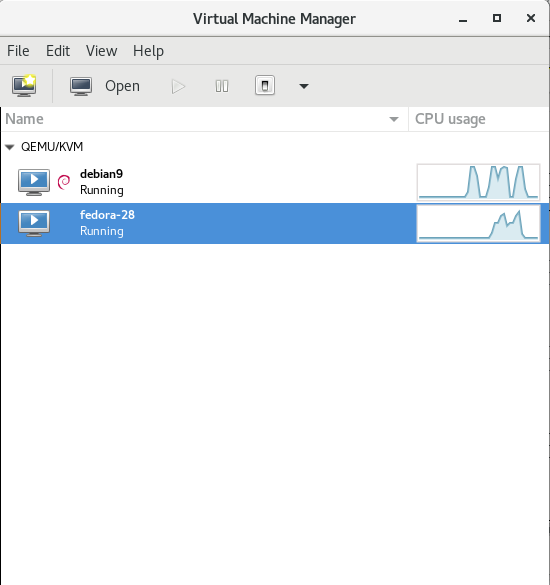 An alternative way is to use virt-manager GUI KVM desktop management interface and click over the Virtual Machine Guest name, in same fashion like in VirtualBox. If you have KVM running on your Linux desktop PC / notebook you can also connect via VNC with virsh command. Using KVM to experiment with different OS distributions is really fun just like you can easily run a number of the major most popular Linux Distributions and a set of different versions. It takes few minutes to have a fully functional Linux to play with and it saves a lot of hassles when dealing with GNU / Linux and FreeBSD, doing so in Virtualbox for me prooved to be much more complicated (not to mention that often Virtualbox had an ugly bugs so even Importing an Appliance as a Guest VM with an official distro OS-es failed with weird errors. There are plenty of Web Interfaces for Management KVM (proprietary and free software) that could even futher simplify the use and deploy / destory of KVM VMs. All that makes possible running your own Linux or Web hosting provider a relatively easy task and seriously could cut business expenses and operational (maintenance) costs. If you plan to run youw own hosting company, I can help you establish your infrastructure and advise you on the right technologies to use. If you're on Linux the questions like, how can I convert between video and audio formats, how to do photo editing etc. etc. have always been a taugh question as with it's diversity Linux often allows too many ways to do the same things. In the spirit of questioning I have been recently curious, how can a subtitles be added to a flash video (.flv) video? After some research online I've come up with the below suggested solution which uses mplayer to do the flash inclusion of the subtitles file. While including the subtitles to the .flv file, it's best to close up all the active browsers and if running something else on the desktop close it up. 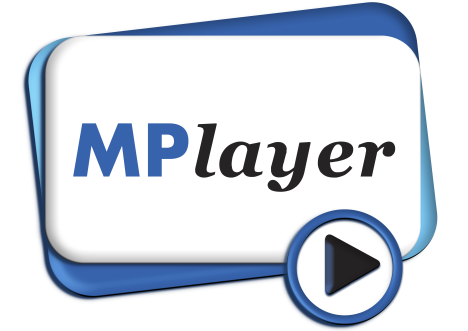 Note that above's mplayer example for (.srt and .sub) subtitle files example is only appropriate for a .flv movie files which already has a third party published subtitle files. What is interesting is that often if you want to make custom subtitles to let's say a video downloaded from Youtube on Linux the mplayer way pointed above will be useless. Why? Well the Linux programs that allows a user to add custom subtitles to a movie does not support the flv (flash video) file format. This methodology is really long and time consuming, but pitily as far as my understanding goes it's the only way to do that on your Linux until now. You will also have to spend some time to get to know gnome-subtitles or subtitleeditor, but it won't be that long until you get the idea on how to use them.